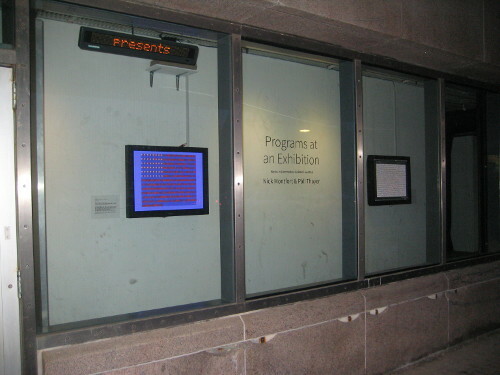 Here’s some documentation of “Programs at an Exhibition” by Nick Montfort & Páll Thayer, an exhibit of five Commodore 64 BASIC programs and five Perl programs at the Boston Cyberarts Gallery, March 6-16, 2014. 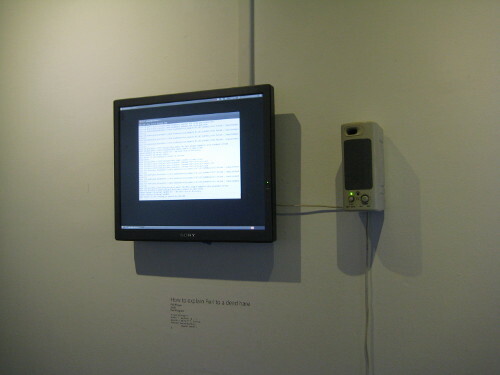 The front of the gallery hosts a Commodore 64 running Nick Montfort’s “After Jasper Johns” (left) and an Intel/Ubuntu computer running Páll Thayer’s “Flag” (right). These two pieces respond to and rework the famous 1954 painting, Flag, which is in the collection of the MoMA. Jasper Johns, we salute you. 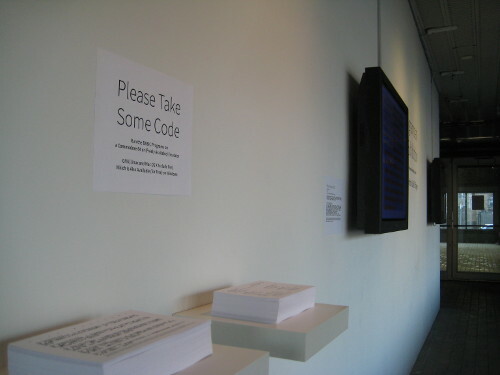 Visitors are invited to take cards with all of the code to the five one-line BASIC programs and the five Perl programs that are running in the gallery. 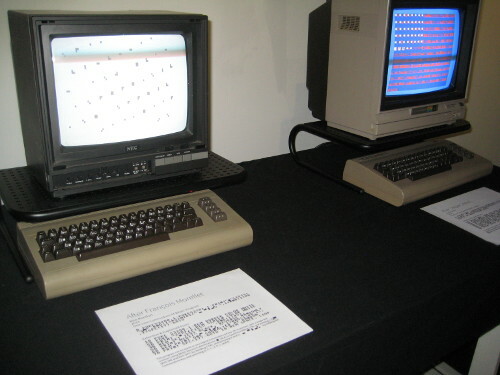 For you online visitors to this documentation, a disk image of the five C64 BASIC programs can be downloaded; VICE or another C64 emulator can be used to load, run, list, and modify the five programs on that image. (Except for “Zen for Commodore 64,” the programs do have to be retyped or broken into several lines to be modified.) Also, Páll Thayer’s entire Microcodes series, which includes the exhibited programs and which Thayer began in 2009, is online. Páll Thayer’s “How to explain Perl to a dead hare,” based on the similarly-named 1965 performance by Joseph Beuys. The Perl program reads the Perl documentation aloud, one word at a time. The Perl documentation, incidentally, is really quite amusing to listen to. Páll Thayer’s “Erased de Kooning” enacts (repeatedly, in this instance) the erasure of one of Willem de Kooning’s drawings by Robert Rauschenberg. Nick Montfort’s five Commodore 64 programs running on five of the taupe keyboard-and-CPU units. 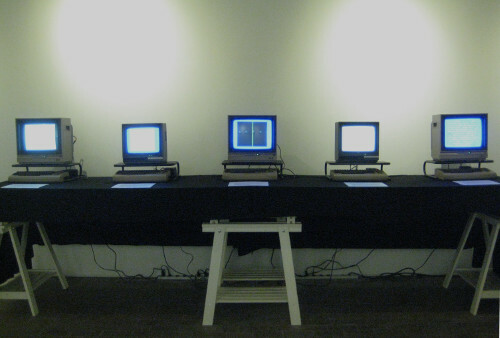 Two of the monitors, the smaller ones, are NEC 12″ CRTs; the other three are Commodore 1702 CRT monitors. On the middle display, one of the zip paintings generated by “After Barnett Newman” can be seen. On the left, Nick Montfort’s “After François Morellet,” which presents in one-character form all of the paintings that Morellet would have eventually painted if he continued to do other panels in his 1958 “6 répartitions aléatoires de 4 carrés noirs et blancs d’après les chiffres pairs et impairs du nombre Pi.” On the right, the instance of Nick Montfort’s “After Jasper Johns” that is running on a CRT monitor. As with all of the programs, the complete code is presented along with the work’s title, the year of development, and the aritst’s name. The BASIC programs are also written out in a clearer form, with comments. I’m so glad to see that the CRTs showed up in the photos! 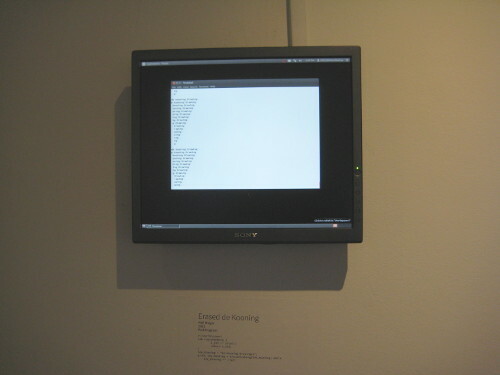 I really like your Morellet program, thanks for sharing. I’d love to get a better look at those handouts too! C64 and Perl cards from the exhibit.